Optimism tempered by fear. That is the mood at the annual meetings of the International Monetary Fund and World Bank in Washington DC. The capital of the US has also been the heart of the liberal international economic system for more than 70 years. Yet the Trump administration sees this great success as a plot against America. Political clouds now cast dark shadows over a brightening economy. Over the past decade, three successive shocks have battered the world economy: the financial crisis of 2007-09; the eurozone crisis of 2010-13; and the commodity price collapse of 2014-15. But all is now calm. The IMF’s World Economic Outlook expects that only six of the 192 economies it covers will fail to grow in 2018. Global growth is currently forecast to reach 3.6 per cent (at purchasing power) this year and 3.7 per cent in 2018, well above the miserable 3.2 per cent of 2016. Among important high-income economies, the outlook is better now than in April for all but the US and Brexit-hit UK. The eurozone economy is forecast to grow by 2.1 per cent this year and 1.9 per cent in 2018, close to the 2.2 per cent and 2.3 per cent of the US, though the UK economy is, all too plausibly, forecast to grow by a mere 1.7 per cent in 2017 and then 1.5 per cent in 2018. True, reasons for worry remain. That might even be a good thing: euphoria has so often proved a harbinger of crises. Financial risks are evident in many high-income countries, as well as in China. Debt levels are generally high by historical standards and, in some cases, rising. Assets are also generously priced by historical standards: the valuation of US stocks is not that far from the historic peaks reached in 1929 and 2000. As important, economically and politically, growth in high-income countries remains structurally weak: productivity growth is limping and labour markets have been generating surprisingly slow growth in wages and disposable incomes. In some cases, notably the US, employment ratios are also low by historical standards. Moreover, while high-income economies have been healing from the Great Recession, its effects remain very much with them. The aggregate real gross domestic product of the high-income countries is about a sixth smaller than it would have been if pre-crisis rates of growth had continued. Yet the recession’s political effects may well be far more important. The crisis and its lingering aftermath have damaged confidence in elites. This shock came on top of a host of uncomfortable social and economic changes. Taken together, these upheavals have, as so often before, opened the way to demagogues, promising simple solutions to complex problems. This happened in the Brexit campaign in the UK, where a small majority was induced to choose a journey to an unknown destination. This has happened in Catalonia, launched on a potentially devastating journey to independence. It has happened, above all, in the US, where the implications of Donald Trump’s election remain almost as obscure as they were on the day of his inauguration. Inevitably, the transformation of US policy is far and away the deepest worry. This might still amount to little more than sound and fury signifying nothing. But it is also far too early to be confident of that. The administration seems set on vast tax cuts at a time of near full employment. It suggests that this will somehow create a huge upsurge in growth. That is not inconceivable, but it is hugely unlikely. More likely are rising inflation, a sharp rise in interest rates, a higher dollar and a huge surge in the current account deficit. Meanwhile, the administration is also set on the opposite objective of reducing the external deficit through a series of negotiations, starting with Nafta. The aim of fixing an overall current account deficit through bilateral trade negotiations is not only intellectually incoherent, but clashes directly with its fiscal policies. It may be nonsense, but it could lead to the cumulative unravelling of the global trading system. As important might be the choice of the next chair of the Federal Reserve. We have learnt many times the enormous impact of that choice in shaping not just the US, but the world, economies. It is a job in which the wrong person can do an enormous amount of damage. Beyond this is the fear of global conflict. Of great long-term significance could be the determination of the president to decertify Iran’s compliance with the deal on nuclear arms, without supporting evidence. This would demonstrate that a deal with the US means nothing. Quite as dangerous would be an attack on North Korea, which would almost certainly devastate an important US ally, South Korea. That would demonstrate to America’s other allies that they are also dispensable. Maybe, as economies improve, the anger that led to the populist upsurge might dissolve. The question is whether such a political recovery might prove too late. This is a time of high uncertainty. The demagogic tide might amount to little, in the end. But inevitably these risks shadow the talks in Washington. Markets happily ignore it. Markets might be wrong. The eurozone has survived the twin shocks of the global financial crisis of 2007-09 and its own crisis of 2010-12. It is enjoying a good recovery. That is no justification for complacency, however: the eurozone’s real output per head has suffered a lost decade. The recovery is, rather, an opportunity for reforms, at both national and eurozone level. The question is which reforms to choose. A decisive moment was Mr Draghi’s remark, in July 2012, a moment of crisis in sovereign debt markets, that: “Within our mandate, the ECB is ready to do whatever it takes to preserve the euro. And believe me, it will be enough.” He was right. The announcement of the ECB’s “Outright Monetary Transactions” programme in August 2012 turned his promise into a policy. That shifted market opinion and lowered elevated yields on Italian and Spanish sovereign bonds. The ECB slashed interest rates and, in 2015, also launched its asset purchase programme. Other steps have included the creation of the European Financial Stability Facility and its permanent successor, the European Stability Mechanism; programmes of support for crisis-hit countries, four of which — those for Cyprus, Ireland, Portugal and Spain — have now concluded successfully; the determination of crisis-hit countries to do what was required to stay in the eurozone; the creation of the Single Supervisory Mechanism for banks; and steps towards a banking and capital markets union. Whatever the mistakes made in creating and running the eurozone, members have shown themselves far more determined to keep it afloat than outsiders, notably in the UK and US, expected. Yet challenges remain. In its most recent analysis of the eurozone, the International Monetary Fund notes that: “The crisis of the years 2007-08 marked the end of the convergence trend and the start of a divergence trend, which is only slowly being corrected.” True, some crisis-hit countries have shown dramatic recoveries, in particular Ireland. The real GDP per head of Portugal and Spain is also back where it was in 2007. Yet Germany’s has risen 20 per cent relative to that of Italy over the past decade. Greek real GDP per head is still more than 20 per cent lower than it was in 2007. Joblessness also remains elevated in Greece, Spain and, to a lesser degree, Italy. Public and private indebtedness also remains high in many countries. It is helpful therefore that the growth of nominal GDP is now above the yield on government bonds, even in Italy. Partly because of the debt overhangs, but also because the patience of the public has frayed and the room for policy manoeuvre is limited, another shock could be a disaster. This recovery must endure. So the ECB must not tighten prematurely. After all, core consumer price inflation has been below 2 per cent since 2008. Fiscal policy should also be used wherever there is room, notably in Germany. The weaker economies must also push ahead vigorously with pro-growth and pro-employment reforms. What, then, of the eurozone reforms? I doubt the wisdom and feasibility of Emmanuel Macron’s proposals, particularly his ideas for substantially enhanced fiscal integration. The results of the German election must also make big moves towards this far harder. The banking union does need a fiscal back-up for deposit insurance. But that may be as far as fiscal integration can go. Adam Lerrick of the American Enterprise Institute has suggested a scheme for mitigating the impact of asymmetric fiscal shocks, without ECB support and without ongoing fiscal transfers. In a crisis, yields on government bonds of vulnerable countries rise relative to the stronger ones. According to Mr Lerrick, at the peak of the eurozone crisis, in 2012, the unexpected increase in relative interest rates cost Spain and Italy more than €5bn per annum combined. Over a seven-year average maturity, the impact reached more than €35bn. If a part of the gains of the strong were transferred temporarily to the weak, this impact would be mitigated. Under Mr Lerrick’s proposal: “Members that receive an unexpected decrease in relative financing costs will contribute 50 per cent of their gain into a Eurozone Financing Cost Stabilisation Account.” These funds would go to members that have an unexpected increase in relative financing costs, to cover 50 per cent of their loss. Transfers would halt once relative yields stabilised and would be paid back as they reversed. Countries would only be eligible if they stuck to the fiscal rules. This plan would not require a new treaty, would not generate ongoing transfers and would not socialise credit risks. But it would be a gesture of solidarity. It would also reduce the need for the ECB’s outright monetary transactions. Politically, therefore, this idea might be attractive to Germans, while strengthening the solidarity that others desire. This is the sort of imaginative idea that the eurozone should be looking at. The eurozone will never be a normal fiscal federation. It is necessary to invent alternatives. It is vital that the eurozone does not merely survive, as it has, but thrives, economically and so politically. So the period of recovery is an opportunity for members to push ahead with reforms, both individually and collectively. If they fail, still worse crises might arrive. CAMBRIDGE – Many who attended grade school during the Cold War will remember what they were instructed to do in the event of a nuclear attack. When the siren wailed, US students were told, one should “duck and cover.” Apparently, squatting under your desk with your arms covering your head would save you from nuclear annihilation. If only it were so. To recall this absurd advice is also to appreciate the current angst now being felt in Japan. Several times in recent weeks, cellphone texts (today’s sirens) have informed the public that the faint streak in the sky overhead is an intercontinental ballistic missile launched by a nuclear-armed 33-year-old dictator with impulse control issues. This is a manmade threat to the world order that Atlantic-hugging policymakers and pundits, buffered by a continent and a large ocean to their west, may not fully appreciate. But the threat posed by North Korea’s Kim Jong-un has had a significant effect on global financial markets in recent months. Simply and discouragingly put, sabre-rattling on the Korean Peninsula has increased the risk of direct conflict with the North, which would shatter the relationship between China and the US. Any such conflict would involve massive loss of life and trigger a large regional, perhaps global, contraction in economic activity. The theory of “rare disaster risk” has progressed considerably in recent years, owing to the work of the Harvard economist Robert Barro. The core insight is that no one can rule out the occurrence of an Old Testament-style event – war, famine, pestilence, or societal collapse. Such disruptions to a settled way of life slash output, consumption, and human welfare. Because they do not happen often, they are far removed from the smooth center of the probability distribution from which baseline scenarios are drawn. The experience of the Great Recession tells us what to expect from financial markets when output plummets: as inflation tumbles, so do nominal and real (inflation-protected) yields on Treasury bills. The yield curve flattens because owning a long-term term claim on a safe-haven asset is valuable insurance. As yields on Treasury securities fall, other spreads widen relative to them. In the current context, geopolitical tensions create the remote possibility of a disaster – the odds of which shift daily – that would make everyone much worse off. We claim no special insight into the mind of Kim Jong-un, but knowing that there is an unknowable helps to make sense of current asset prices. In such circumstances, risk-averse investors, especially those more directly in harm’s way along Asia’s Pacific Rim, will want to insure against an adverse event by taking advantage of the expected financial-market effects now. Nominal, real, and inflation-break-even Treasury rates are lower than the cyclical position of the economy warrants, owing to investors’ perception of acyclical and atypical risk. In a recent speech, Gertjan Vlieghe, a member of the Bank of England’s Monetary Policy Committee, pointed in the same direction. He explained that when future consumption prospects are misshapen relative to the tried-and-true bell curve, so that there seems to be a higher chance of bad outcomes, the market-clearing (or “equilibrium”) real interest rate falls relative to its history. The growing perception of rare disaster risk has three implications. First, low interest rates do not necessarily indicate that advanced economies are mired in a low-growth trap as a consequence of adverse demographic trends and slow productivity growth. Rather, they tell us that competition for safe assets has heated up. Second, this is no counsel for government to ramp up spending. The near-term cost of financing deficits is low because households are worried that the possible “seven lean years” will be very lean, indeed. If citizens are storing up for the worst case, are their leaders – even officials concerned about the cyclical management of aggregate demand – justified in throwing caution to the wind? And, third, low policy interest rates in the advanced economies are not necessarily evidence of ample accommodation by the monetary authorities. This is because monetary-policy ease is measured in terms of the difference between the actual rate and the equilibrium rate. The current low policy rates maintained by the US Federal Reserve, the European Central Bank, and the Bank of Japan may not look so low if the equilibrium rate is actually low. The idea of rare disaster risk complements other explanations for the current low level of real rates globally. Perhaps the risk of a remote catastrophe is what created the “global saving glut” that former Federal Reserve Chair Ben Bernanke warned about in 2005. And, if government officials are worried about future conflict, they may have greater incentive to push real interest rates lower through “financial repression,” so that they have sufficient budget space to prepare. These, however, are explanations of longer-term trends. Recognizing the existence of the global savings glut helps us to understand the 15 years after the Asian financial crisis of 1998. Financial repression makes sense of the experience after wars or on other occasions when government debt piles up. Rare disaster risk is most likely a contributing factor in such episodes, and it may be even more relevant for explaining short-term dynamics in financial markets when missiles fly. Carmen Reinhart is Professor of the International Financial System at Harvard University's Kennedy School of Government. Vincent Reinhart is Chief Economist for Standish Mellon Asset Management. 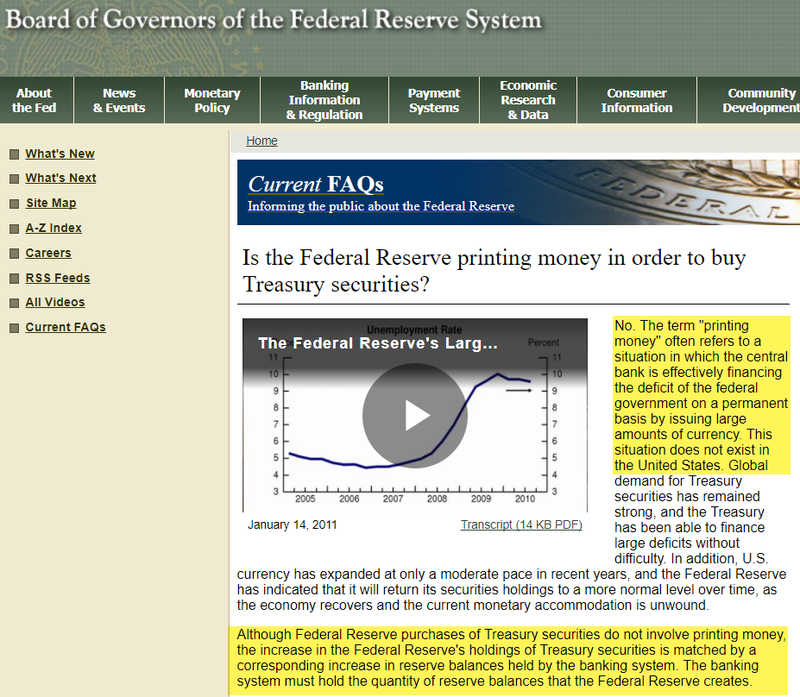 - The Fed has no authority to print money; they never have printed money and can only create reserves. - Reserves are not money. Reserves are not part of M1 or M2; they are part of the monetary base. Banks create money through loaning out reserves. - Tightening monetary policy will ultimately reduce velocity of money and further dampen the inflation rate. - There has been no inflation because there has been no outsized increase in the currency in circulation. The rate of M2 growth has remained constant but is beginning to decline. There is a fundamental misunderstanding about the way in which the Federal Reserve conducts open market operations, monetary policy and the impacts of those actions. Conventional wisdom suggests that the Federal Reserve 'prints' money to buy financial assets, namely treasuries (TLT) (IEF) and mortgage-backed securities. Taking this thesis further suggests that the increase in the money supply should have translated to a decline in the value of the dollar and an increase in the rate of inflation due to the excess money creation. The fact that neither a decline in the value of the dollar nor an increase in the inflation has materialized has puzzled investors and economists alike and has consensus opinion perpetually believing that inflation is right around the corner. Much to the chagrin of these wrongfully informed investors and pundits, interest rates continue to march lower due to persistently low inflation, continued slow growth and ever increasing levels of debt. Had investors understood the true mechanisms regarding Federal Reserve policies and the fact that there was never an increase in the money supply beyond what has been historically average, the calls for inflation and dollar debasement would have been pushed aside as an incorrect thesis. Due to the ubiquitous nature in which this false narrative has been perpetuated, an incorrect narrative has been ingrained in the minds of the average investor, and professional for that matter, that has caused a constant incorrect call for inflation, growth and interest rates. I will show how this is in fact true and I ask for thoughtful investors to read the entire thesis. 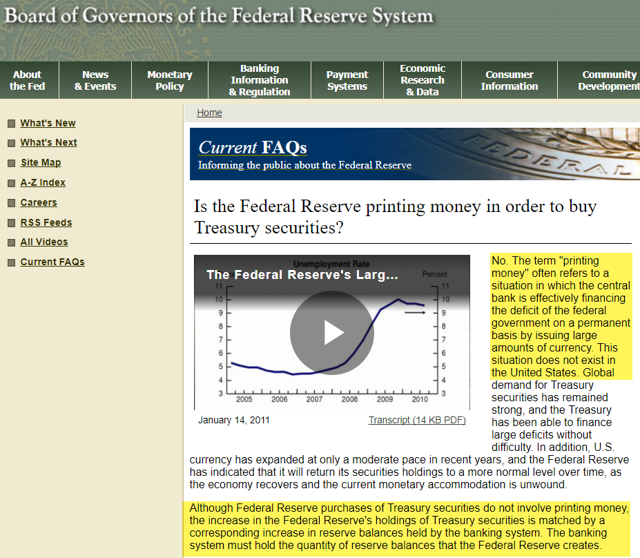 You do not have to take my word for it; on the Federal Reserve website it clearly states that the Federal Reserve has no legal authority to print money. The highlighted section in the picture below explains how the Federal Reserve has never printed money but instead, buys financial assets through a corresponding increase in excess reserves rather than currency creation. Many will say this is the same thing but it is factually incorrect as reserves are not included in M1 or M2 money supply and are not money. If you argue that the Federal Reserve prints money, then by definition, you must argue that reserves are in fact money. Reserves are not money. Reserves are held by banking institutions and only become money accessible to the public after a bank decides to loan out the money or purchase financial assets, both of which have occurred in small amounts relative to the trillions of excess reserves held by banks. Once a bank loans out their excess reserves, this money is now recorded in M2 and can now be considered "created money." The fact that there has been no material inflation debunks the idea that the Federal Reserve flooded the system with $4 trillion dollars of "money." They did not. They created that amount in reserves, only a small amount which made it into the public through bank loans. You can see how, through this process, it is banks that create the money, not the Federal Reserve. Had the Federal Reserve handed the banks $100 trillion, this money would still have not reached circulation as the banks need to find demand for this money. There is no demand for $4 trillion or $100 trillion in such a short period of time, so instead, the money remains at the banks, collects interest on excess reserves and never reaches the public, thereby never increasing the money supply and never increasing the rate of inflation. Below are a series of charts that will help illustrate the points that I just briefly summarized. The Federal Reserve policy has had unintended consequences but not in the form that many are programmed to believe. Interest rate manipulation on the long end of the curve is simply not true. The Federal Reserve has little control, if any, over the long-term interest rates; those are determined by the long-run trends in inflation. The Federal Reserve does, however, have nearly complete control over the short-term interest rates. The charts below will reiterate the thesis I summarized and also provide a counter-view into the true consequences of Federal Reserve policy and also how the recent tightening of monetary policy is a mistake that is leading the economy towards recession at an accelerating pace. Below is a chart on the growth in currency in circulation. I used a 5-year annualized growth rate in the currency in circulation to show how there has been no material increase in the growth rate in currency beyond the historical average. In fact, the current rate of growth in currency is on the lower end of the average over the past decades. Neither QE1, QE2 nor QE3 can be spotted on the above chart as the process of quantitative easing never involved printing "money" or increasing the money supply; it only increased the value of excess reserves. The next chart is the same 5-year annualized growth rate but of the M2 money supply. M2 is a measure of the money supply that includes all elements of M1 as well as "near money." M1 includes cash and checking deposits, while near money refers to savings deposits, money market securities, mutual funds and other time deposits. These assets are less liquid than M1 and not as suitable as exchange mediums, but they can be quickly converted into cash or checking deposits. If M2 contains all elements that are 'near money' yet the growth rate showed no material impact by the three rounds of quantitative easing, then it must be true that the reserves created by the Federal Reserve are not "near money." While reserves are not considered money and therefore not included in the above calculation of M2, reserves are included in the monetary base. To illustrate how quantitative easing increased the monetary base but NOT the money supply, below is a chart of the 5-year annualized growth rate in the M2 money supply and the monetary base. The growth rate of M2 can be seen as flat throughout the past few decades, even through rounds of QE, while the monetary base exploded in growth only in this past decade as the Federal Reserve embarked on easy monetary policy through quantitative easing. Again, this can be seen as evidence, along with the words from the Federal Reserve website that states that the process of money creation from the Federal Reserve does not exist in the United States. The Federal Reserve does not print or create money; they only are able to increase the monetary base through crediting the reserve balances of depository institutions. The above chart shows the explosive growth in the monetary base but not in the money supply. This is because excess reserves are included in the monetary base but not in the money supply. The next chart shows the 5-year annualized growth rate in excess reserves, which can be seen as a near one-for-one correlation to the growth rate in the monetary base, indicating that the process of quantitative easing increased excess reserves, a pool of money only accessible to banks and not the general public until the banks decide there is a viable place to put that money in the form of loans or asset purchases. To solidify this point, the next chart graphs the nominal value of the monetary base and excess reserves and they can be seen moving together after 2009 and during each phase of quantitative easing. Again, reserves are not money. They simply do not fit the definition of money and it is not a point of debate. The process by which banks create money from reserves is through loans and asset purchases. The rate at which banks create money from reserves is called the money multiplier. A low rate of the money multiplier means that banks are not creating a lot of money from reserves. This suggests that banks are not finding the demand for loans or a place to put their reserves. It is not a supply issue; the banks have trillions of dollars of reserves they have the ability to transform into money, but they are choosing to not lend that money out. This is not a new paradigm as the money multiplier, the rate at which bank reserves are loaned out and transformed into money, has been steadily declining for decades, getting lower each and every cycle. The persistent drop in the money multiplier indicates that there is a structural weakness in the economy that is causing a reduction in the demand for loans. Not only is there a weakness in the economy, but that weakness has been getting more intense over the years as the money multiplier continues to fall. This lack of demand has to be true because there is not a lack of supply on the part of the banks. As the charts above show, they have a newfound trillions of dollars of reserves (supply) waiting to be loaned out but as the money multiplier indicates, the banks are converting those reserves into money at nearly the slowest pace ever. There is ever weakening demand for loans each and every year that reduces the money multiplier, making each and every marginal dollar of reserve increase (quantitative easing) less and less effective as that marginal dollar will not be transformed into money. The reason that the demand for loans has decreased each and every year and thus crashed the money multiplier and rendering the process of quantitative easing ineffective is due to increased levels of debt. You cannot solve a debt problem with more debt, and that is what the United States and essentially every other developed country has attempted to do. It is also the reason that quantitative easing has been ineffective in creating growth. Sure, the stock market (SPY) has increased, but the underlying fundamentals of economic growth have not increased as the 10-year annualized rate of growth and inflation are near their lowest levels ever. The hope surrounding quantitative easing was based around the idea that if trillions of dollars were given to the banks, then the banks would loan that money out and that would increase the money supply, increase inflation and solve the long-run deflationary spiral that we are in that can be seen in the secular decline in long-term interest rates. The issue is demand for loans, not supply. The supply was increased by the Fed but the demand is something that cannot be artificially created and therefore, those reserves were never created into money and the problem of low growth and low inflation were made worse as debt levels increased. Now that the process of money creation has been thoroughly covered, and it can be agreed upon that the issue is one of structurally weak demand, not supply. I briefly mentioned that debt was the cause of ever decreasing rates of growth and inflation. The next article in this series will cover the unintended consequences of the Federal Reserve policy as well as cover the structural issues brought on by increased levels of debt in great detail. Lastly, the next article will clearly show how the Federal Reserve tightening monetary policy is a guaranteed path to lower growth and lower inflation, which will perpetuate more of the same economic condition that we have seen in the form of lower inflation and lower growth over the next several years. Germans headed to the polls over the weekend in an election that saw declining support for establishment parties and rising popularity of a formerly fringe nationalist party. Chancellor Angela Merkel’s Christian Democratic Union experienced its worst performance since the end of World War II. Support for the Social Democratic Party fell to record lows. But the nationalist Alternative for Germany party, known as AfD, which was founded just four years ago, became the third-largest party in parliament, winning 13 percent of the vote. Clearly, there is a shift taking place in German politics. 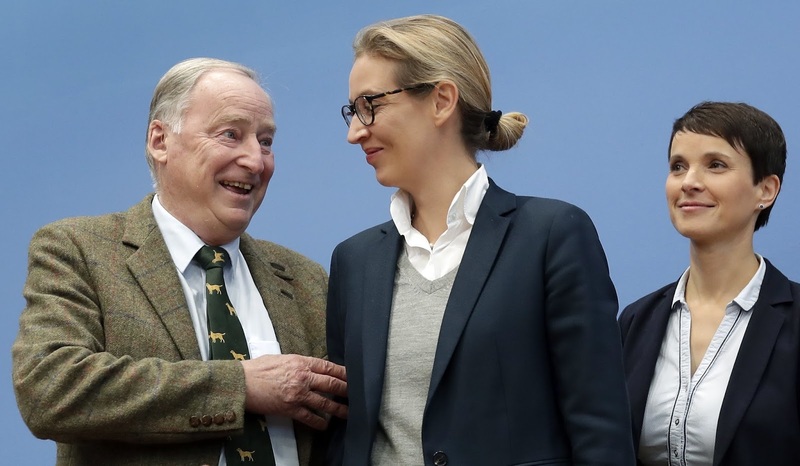 The left’s popularity is declining throughout the country – although it is diminishing more slowly in eastern Germany – while the AfD’s support is growing. And, more important, the election results confirm that the German party system has fragmented, as divisions in German society have increased. Berlin isn’t the only European capital that has seen a nationalist party rise to become part of parliament, but considering that it is the de facto leader of the EU, we need to examine what this could mean for the rest of Europe. The AfD is the first nationalist party since the end of World War II to enter the German parliament. In the 1960s, both conservative and communist parties were represented in parliament, but nationalism was low. Memories of World War II were still fresh in the minds of many, and most were unwilling to allow nationalist forces into mainstream politics. But dissatisfaction with mainstream parties, particularly the governing CDU and SPD, has been growing because of the country’s socio-economic problems, and it is out of this dissatisfaction that the popularity of the AfD has emerged. Germany has the biggest economy in the European Union and dominates the bloc politically. It suffered the least from the economic crisis in 2008, but it hasn’t been immune to the problems facing other countries in the union. The German economy is largely dependent on exports, and the EU is its most important export market, so the economic struggles in other EU members will impact Germany as well. Germany hasn’t faced high unemployment rates or staggering debt, but it has seen a general slowdown in the economy. This has meant that, while it may not be reflected in official statistics, some people have lost their jobs – possibly more than once since 2008 – and others haven’t received raises. The refugee crisis only compounded this problem. Those most affected believed that the German government, just like the EU, couldn’t solve the issues that arose from the 2008 crisis. AfD took advantage of this discontent, campaigning on the idea that radical change was needed. The factors that led to the rise of nationalism in Germany may be similar to those that led to the rise of nationalism in other European countries, but Germany is also a unique example because of the social divisions between the country’s east and west, which can largely be explained through its history. Reunification in the early 1990s didn’t solve the divisions between East Germany and West Germany. Both populism and nationalism have risen faster in the east than in the west, and left-wing parties have enjoyed more support in the east. The SPD has promoted a more populist agenda in the east so that it could compete with the Left Party, which tends toward communist principles. The east is still struggling to fully transition out of its communist past. Considering that the east is the poorest region in Germany and that the socio-economic problems spreading throughout Europe have affected the east more than they have affected the west, it was fertile ground for the AfD to promote its agenda. This weekend’s election results further highlight the extent of the division in the populace, as support was split between a number of parties. The CDU won 32.9 percent of the vote. But to form a government, it will need the support of the Green Party, which won 9.3 percent of the vote, and the conservative Free Democratic Party, which won 10.5 percent. (It is unlikely that the SPD will be willing to enter another coalition with the CDU.) The Greens and the FDP won the majority of their support in the west; the AfD and the Left Party won the majority of their support in the east. The opposition will be split between radically different parties – a weakened SPD and Left Party and a strengthening AfD – although they all find much of their support in the east, while the governing parties will more heavily represent the west. Governing will likely become difficult, and the government will need to find a balance between the priorities of the east and west. This outcome will also make it difficult for the government to implement any reforms, both in Germany and in the EU. France, Italy and Spain have submitted proposals to increase EU investment and introduce risk-sharing measures for the eurozone – all of which will be discussed at the next meeting of the European Council. Germany has thus far played a significant role in managing EU affairs, partly because it was politically stable – the rest of the EU could trust that Merkel’s words had weight. But she is no longer backed by a large majority. This limits her power both inside and outside Germany. The ideological composition of Merkel’s government and, more important, the increasingly nationalist opposition will influence Germany’s role in EU reform negotiations. Germany will continue to support more integration for the EU – because this will help its economy grow – but Merkel will likely become more cautious in supporting ambitious reform projects, including a common immigration policy. It is likely that euroskepticism in Germany will increase, since compromises will need to be made between the northern and the southern blocs of the eurozone. With the AfD now in parliament, reluctance to share risk with southern European members will only grow. In addition to confirming the fragmentation of the German political system, the election results indicate a shift in Germany’s role in the EU. The German establishment can no longer ignore the popularity of nationalist parties. It will have to confront the AfD, which has reintroduced a discussion on nationalism in mainstream politics. Considering Germany’s key role in the European Union, such a confrontation will have a direct impact on how the bloc will evolve. Alternative for Germany plays to the worst impulses of the country’s history, and Angela Merkel let them win. “Nazi” is the foulest word in the German language. It shouts horror, depravity, war. Other countries have started to find ways to joke about it over the past generation, as with the Soup Nazi character who tyrannized lunch customers on the 1990s American television comedy “Seinfeld.” Not the Germans, for whom the wretched memory of the 1930s and ’40s still stokes fears about the true national character. But the N-word is now spoken out loud, a warning flare concerning the Alternative for Germany (AfD) party’s entry into the Bundestag in Sunday’s national election. That the party is now the third-largest group in parliament dims the beacon of global leadership Chancellor Angela Merkel once claimed Germany held up for the world. The beacon already was flickering after financial trickery at Deutsche Bank and environmental scandals at Volkswagen . The AfD leadership calls for pride in the “achievements” of German soldiers in two world wars and an official end to forced German historical “shame”; it says Islam has no place in the country, and that the Quran inspires terrorism; and it has found room for candidates who have been blatantly anti-Semitic or seek an end to Europe’s ethnic diversification. Add anti-NATO, anti-American, anti-European Union and pro-Russian views. Others are tougher. “For the first time since the Reichstag in 1945,” Foreign Minister Sigmar Gabriel, a Social Democrat, said recently, “real Nazis will be standing at the speakers’ podium” in the parliament. “The AfD embodies such a mass of right-wing radical/reactionary tendencies that can be seen as parallels to the German nationalists who, in opposing the Weimar Republic before 1933, prepared the way for the National Socialists,” the official name of the Nazi party. Alexander Gauland, who led the AfD ticket, denies any such link. But after more than 50 years keeping right-wing extremism out of a central political role, the party’s result is a historical breakthrough. It could turn out to be a blow to Germany’s stability, and another blow to the self-confidence of the West. He’s not wrong. Once described in another context by the Frankfurter Allgemeine Zeitung as behaving more like the United Nations secretary-general than the chancellor, Mrs. Merkel refused to fight the AfD head-on during the election, choosing to sell her everything’s-great-in-Germany routine instead. Fat chance. This is the noncombattant Mrs. Merkel who also says that there is no military solution to crises in Crimea, Syria and eastern Ukraine. Tell that to Russia. Mr. Winkler, the historian, bemoans what he calls, as if it were disappearing, “the old Federal Republic” of the West. And the new one? This year he appeared on the AfD campaign trail alongside Martin Hohmann, an apparent winner of a seat Sunday, whom Mrs. Merkel threw out of the Christian Democratic Party in 2003 when he said that Jews tried to label Germans “a people of perpetrators” while they were that themselves. And this from the Frankfurter Allgemeine Zeitung on a restaurant-bar gathering in Görlitz Saturday night. It included Jens Maier, another apparent AfD winner, who has talked about the current “manufacture of half-breeds” in Europe. Someone asked how many people were at a Maier rally earlier.